When we moved from chalkboards, transparencies and overhead projectors to Powerpoint Presentation Decks and presentations on Prezi, we thought technology would make our presentations more professional. Instead, they’ve only magnified our problems. We focus so much on the format, and forget the ideas we are supposed to be communicating. Success means convincing others of our ideas. So brush up on your public speaking skills follow these easy steps to creating an effective and interesting PowerPoint presentation. What works for papers works for presentations. That English teacher who made you write an outline before you wrote your paper was on to something. Unless you plot out what your presentation is going to be about, it will lack focus and organization. The audience won’t follow you. It won’t look very professional. Sketch out the presentation on a paper and choose a slide theme in Powerpoint or Keynote. Decide how many slides or Prezi presentation objects you want. Some presentations are so cluttered with information it is hard to follow them. They are my own. I’m often trying to get across too many details. Others have as little as three words and three bullets with nothing else; this type of presenter hopes you will hang on every word. 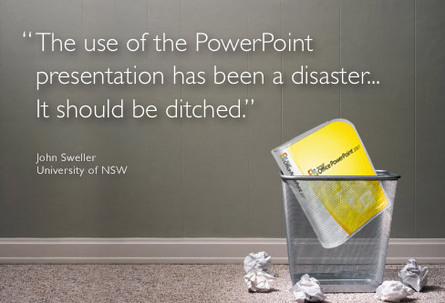 A successful presentation provides no more than 15 words per slide, and no less than ten . That’s based upon data on how fast we speak, read, and write notes. Here's one with too much (//blog.robbiehyman.com/2010/11/19/what-powerpoint-is-not/) and one with too little (//schools-education.knoji.com/how-to-prepare-an-effective-powerpoint-presentation/). One advantage of Prezi is that the tight space will force you to economize your words. You’ve heard the phrase, “A picture says a thousand words.” That’s a myth. But a well-designed graph that summarizes a lot of statistics on a table, or a figure that graphically displays a complicated procedure with objects and arrows could summarize those thousand words. Here is a figure I made from CNN data which graphically represents how many American voters in 2008 felt each of the presidential and vice-presidential candidates were qualified for the job. In addition to having bright colors with meaning (red for Republicans, blue for Democrats), it conveys the simple message that might take two slides or text to explain. I can’t tell you how many times I see someone using less than 20 point font for words, or has fluorescent yellow on a lime green background. If your audience can’t read the message or it blinds them, it won’t show professionalism. A presentation is about professional communication, not about a technology show. Anything that distracts from the theme and message of the talk hurts the success of the presentation. So lay off the flashing Christmas lights border and the text that slowly shuffles in from the right. There’s an old saying that goes “Tell me and I forget. Show me and I remember. Involve me and I understand.” Call on your audience members, ask them question,s or get them to provide examples. A recent survey of our college presentations revealed those that involved the students in the talk got the highest marks on the survey. The best designed presentation will fail unless you practice it. If you are using the presentation deck, a wrong click could incorrectly reshuffle the deck. Many Prezi presentations have awkward moments where the speaker hunts around for where the presentation is supposed to go. And if the presenter doesn’t know the order of events, what confidence will the audience have in the message? Good luck and happy presenting!